Just how strong is the new glass housing on the upcoming Apple iPhone 4? You might want to hold your iPhone 4 tight, as it turns out just a few drops on a flat surface can cause the special glass housing to shatter to pieces. When he introduced the new iPhone 4 at the WWDC conference earlier this week, Apple CEO Steve Jobs said that the company developed a new technology for the glass housing of the iPhone 4. It's called aluminosilicate glass, and is the sort of glass used in the windshield of high-speed trains and helicopters. Unlike the older iPhone models, the iPhone 4 has both the front and back made of this kind of glass, which Apple says is chemically strengthened to be "20 times stiffer and 30 times harder than plastic." In an Apple video, Jonathan Ive, the company's Senior Vice President of Industrial Design, says the new glass housing is "comparable in strength to sapphire crystal." To test these claims, the guys at iFix your i , a company that deals with Apple iProducts repairs, got their hands on what they say are original Apple iPhone 4 parts (without the circuit board) and did some drop tests, checking if it can handle shocks and sudden impact. 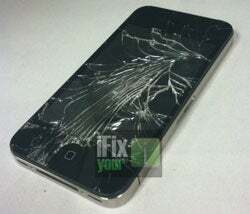 The engineers at iFix your i dropped their iPhone 4 housing three times. The device survived the first two drops, but at the third drop, they say there was a loud 'pop' sound, and the glass housing shattered. The drop was performed from 3.5 feet up, they say. The resulting shatter is shown in the picture above (see one more at this link). On their blog, they point out that on the old iPhone, the glass covering the display was recessed and protected by a chrome bezel, while on the iPhone 4, the glass sits on top of the steel frame, which exposes it more to damage. Note that the back of the iPhone 4 is prone to similar damage, as it's made from the same glass material, though it is housed flush within the frame. The glass screen cover on the iPhone 4 is optically laminated to the new high-resolution 'Retina display', according to aforementioned Apple video. This also could mean that it wouldn't be very easy to repair a broken screen glass cover, and would require replacement of the whole screen. Note that Apple doesn't cover this sort of damage on their warranty policy, which means you will have to either pay for your replacement phone (Apple usually replaces the whole device with a refurbished model), or take it to an independent repair shop (which in turn would void your warranty, if the place is not approved by Apple). PCWorld and Daniel Ionescu are on Twitter. Follow their updates @pcworld and @danielionescu .